The last two weeks have been a delightful hiatus in Birmingham, a city I really like. It was re-vamped a while back with such pride, and the area around Brindley Place in particular boasts enough great restaurants to keep a foodie like me very happy for a fortnight. Bank Restaurant is top of the list, being where I spent pretty much every afternoon, and Loves nearby was a really excellent new find. It’s also a great city for the tour, as the staff of the New Alexandra theatre are beyond compare. We are lucky enough to have met some really excellent, super-friendly crews during our tours: the Alex bunch are a particular huge joy. Kim, the general manager, had made me an astonishing photo print as a welcome gift, along with some excellent whisky. More of that please. Thank you everyone there, it’s always such a treat. The famous Brum friendliness was evident at stage door: numbers are so large outside now that it’s always a bit of a rush, but everyone was super-lovely and didn’t seem to mind. We added a tiny new bit to the show that seems to be working well, on top of the improvements we made back in Oxford. The process of continually trying to improve and tweak is one of the real joys of touring, and of course helps keep the show feeling fresh for me. I donned the classic hat and shades celebrity disguise for a day-off trip to Alton Towers one afternoon with the gang, and we soared and dipped and vomited on Nemesis and Oblivion and Air and all the rest of them. I rather like 13, for what it’s worth. I like a bit of old-fashioned big dipperiness. A bit of plummeting punctuation to my rides. Nowadays it’s all on the one note, all the same velocity and turny-twisty. The past weeks also brought a night where a chap fainted twice on stage (during, for those in the know, THAT bit). Twice! I’m sure it all looked like part of the show, but it provided the sort of extra excitement that I live for. Tonight is our first of three nights in Northampton. I believe it’s also home to a Torchwood convention this weekend. I wonder what sort of cross-over demographic will emerge. I’ll watch out for John Barrowman costumes or sudden bursts of ‘I Am What I Am’ in the stalls. (Do I have that right? I honestly don’t have a TV so I don’t really know what I’m talking about). Righty-ho, carry on about your business. Pleased that the Rapture hasn’t affected show attendance, though I did find myself wondering at a couple of second-half empty seats in the front stalls last night. 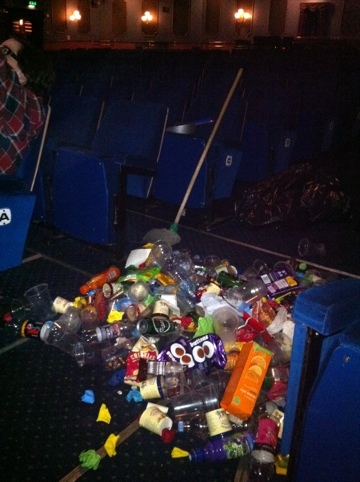 The picture shows the rubbish collected from just ONE QUARTER of the stalls the other night. We’re such a filthy bunch. ROFLing at the Alton Towers game! Would love to see the faces of people seeing those pictures up on the screens!!! Stage blood … aah … Can you hook me up with Jennie please .. .. I sense something crazy in her … in me ..
Keep up the good work .. needless to say .. so many people enjoy it .. Thanks awfully for an exceptionally entertaining evening on the 21st Derren. I was left perplexed and aghast as per usual. Bravo. Methinks an entry from yourself for DMD2 would be fantastic. You have a penchant for portraits after all. Checking that you’ve seen the Charles Rennie M house in Northampton, worth a peek. You lucky people in England! IÂ´m here in Germany and have to work 🙁 I realy wish to visit the show of Derren Brown he is just great ! Amazing show last night Derren, all 11 of us loved it. Some first-timers in my group and they were blown away as I knew they would be. We all came to belatedly celebrate my 30th birthday and it absolutely made it one to remember having caught a frisbee and found myself on stage taking part. I wish I had had the nerve to volunteer for the first bit but then I got a chance to take part later anyway (fate perhaps? althought I don’t believe in it…) Then you kindly signed things, wrote messages and posed for pics. You are just fabulous and so patient and kind to all your fans who were waiting to see you. Hi derren any chance of some dates in Kent? Would love to discuss sesonry accuraty and how one can learn to read signs so quickly. No time to calibrate beyond hello. Amazing skills. Great show last night. One last question when you paint is it a time for peace or pondering ideas. You HAVE to come to Ireland (atleast Northern Ireland!) !!!!!!!!!!!!!!!!!!!!!!!!!!!!!!!!!!!!!!!!!!!!!!!!!!!!!!!!!!!!!!!!!!!!!!!!!!!!!!!!!!!!!!!!!!!!!!!!!!!!!!!!!!!!!!!!!!!!!!!!!!!!!!!!!!!!!!!!!!!!!!!!!!!!!!!!!!!!!!!!!!!!!!!!!!!!!!!!!!!!!!!!!!!!!!!!!!!!!!!!!!!!!!!!!!!!!!!!!!!!!!!!!!!!!!!!!!!!!!!!!!!!!!!!!!!!!!!!!!!!!!!!!!!!!!!!!!!!!!!!!!!!!!!!!!!!!!!!!!!!!!!!!!!!!!!!!!!!!!!!!!!!!!!!!!!!!!!!!!!!!!!!!!!!!!!!!!!!!!!!!!!!!!!!!!!!!!!!!! Was a brilliant show enjoyed it thoroughly, was in hospital and complained i was gonna miss the show so after lots of whining and a male nurse who loves you overhearing, i got ward leave on strict instruction to come back after the show :). You are a truly charming gentleman Derren! I couldn’t stop myself loving you if i tried. You blow my mind with how hard you work and the amount of thought you give to your fans, you really are incredible. I’m coming to see you in Milton Keynes next year, and i don’t think there’s words to explain how excited i am!! I’m really hoping to get the chance to meet you after the show, it would make my year… no, i think it might just make my life! He he! Sounds like Alton Towers was great, i’m a huge theme park fanatic, roller coaster junkie, adrenaline addict etc, and i live for extra excitement too! I’ve been there too many times to count, but i can’t imagine how fun it would be to go there with you – your gang are unbelievably lucky! Argh no way! I went to Alton towers that day too(monday 16th may I remember) and saw yourself but I convinced myself that it was a really (really) good look a like so I wasn’t sure whether I should say hello. now I feel like an idiot knowing it was definitely you! maybe next time? ha. Hi Derren. I saw your show at the Derngate on Tuesday, and I loved it completely. It was my first time seeing you live and I can’t wait until your next tour. I always find that in long shows, my attention starts to wonder after a while but with you, I was totally focused for the entire show, trying to figure out what was coming next. I was startled to find myself locked in the main feature (I hope that’s cryptic enough for anyone who hasn’t seen the show but makes sense to those that have!) it’s a very odd feeling and I can’t get over it. You terrify and fascinate me at the same time and you’d be a very interesting man to share a pint with. Please never stop and come back to Northampton! Who bought a FULL SIZE carton of orange juice to that gig?